Mr. William Lee “Bill” Thompson, 64, of Flora, Illinois, passed away at 6:45 a.m., Tuesday, August 7, 2018, at Barnes Jewish Hospital in Saint Louis, Missouri. Bill was born in Marion, IL, on July 10, 1954. He married Joanie (Lusk) Thompson on April 14, 1979, at Bloom Baptist Church in Flora, IL. He attended Red Brush Christian Church in Louisville. Bill loved his job as a sports announcer for WIKK radio and everything about sports. He enjoyed fishing (especially in the Outer Banks), a good meal and cooking, and straying from the beaten path. Most of all, he loved his family, especially his grandchildren. 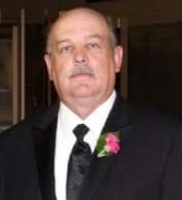 Bill is survived by his wife, Joanie Thompson of Flora, IL; daughter, Tiffany Devore and husband Matt of Flora, IL; son, Dustin Thompson and wife Jennifer of McKinney, TX; and grandchildren, Chloe, Maddie, Chase, Ella, Kayden, and Nolan. He was preceded in death by his parents. Funeral services will be at 12:00 p.m., Saturday, August 11, 2018, at Red Brush Christian Church in Louisville, IL. Interment will immediately follow at Elmwood Cemetery in Flora, IL. Visitation will be from 10 a.m. – 12 p.m., Saturday, August 11, 2018, at Red Brush Christian Church. Expressions of sympathy should take the form of donations to the scholarship fund for Bill’s grandchildren. Online condolences may be expressed at www.kohnfuneralhome.com.